The Scottish Government’s Community Choices Fund was announced on the 26th February 2016 by (then) Community Empowerment Minister Marco Biagi at Bowhill Community Centre, Cardenden, Fife. PB Scotland was there, and the day was a great chance for us to find out more about the local PB activity in Cardenden. The £2 million fund builds on the £500,000 which has already been invested in PB projects across 20 local authority areas. Over the next financial year the funds, which will be prioritised across more deprived areas, will enable further involvement from community organisations and other public bodies. The funding will enable local communities to directly prioritise where they think funds should be spent. The announcement was made at Bowhill Community Centre in Cardenden, Fife. Cardenden was the ideal location for the announcement, as it is one of the many towns in Fife and other parts of Scotland to benefit from a pre-existing support programme for PB in local communities run by Coalfields Regeneration Trust (CRT). This programme, Coalfields Community Futures, involves supporting ex-mining communities to encourage active citizenship and build local democracy through local PB projects. The Minister met with members of Cardenden Community Development Forum, which was the community steering group for the PB process in Cardenden. In attendance on the day were staff from CRT, Fife Council Officers and Councillor Bob Young who is a CRT Scottish Trustee and local councillor for Dunfermline area. Cardenden Community Development Forum was established by a group of local people in response to the Cardenden Community Action Plan 2013-2018, which was developed as part of the Community Futures programme. £30,000 was provided to get the project off the ground and the PB event was held in January 2013. To date the Scouts have purchased a minibus; Auchterderren Church has purchased acoustic panels for their hall; a community notice board has been placed in the centre of the village and Bowhill Bowling Club has been upgraded, and many more. The Development Forum just opened a community charity shop on 25 January 2016 and all proceeds will be re-invested into the community. The building was originally the old public toilets which were converted into two shop units and the charity shop now occupies one of these. Rosemary Wallace from Cardenden Community Development Forum described how PB – funded through Coalfields Community Futures, has physically brought different community projects and groups together into one deliberative process. This means that groups are put in touch with each other when previously many worked in isolation. Through deciding together how money is spent, and following a clear set of guidelines, people from different projects understand more about how investment in other projects than their own benefits the community. Below, Nicky Wilson, Vice Chair of CRT explains the thinking behind the PB approach used by CRT, and emphasises how it builds the confidence of people in communities affected by the closure of mines and brings individual projects together under one umbrella. As Pauline Grandison from CRT explained, the collaborative nature of PB builds skills and confidence within communities so that they can take things forward themselves. As part of the Coalfields Community Futures Programme, recipients are encouraged to develop a community action plan which provides structure and impetus to establish a ‘legacy’. Her colleague, Pauline Douglas, added that it is the participatory element that is crucial. “Small grants lead to quick wins, meaning people get involved. 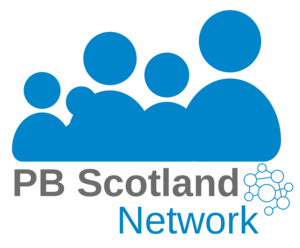 For instance, the local church, Auchterderran Kinglassie Parish Church, received funding through the PB process and now one of the church members is involved in the Development Forum. It’s got people interested that haven’t been involved before.” Pauline Douglas, Coalfields Regeneration Trust. We had time to ask the Community Empowerment Minister Marco Biagi a few questions about what he had announced and his reflections on PB more generally. Here he is talking about the benefits of PB for communities. 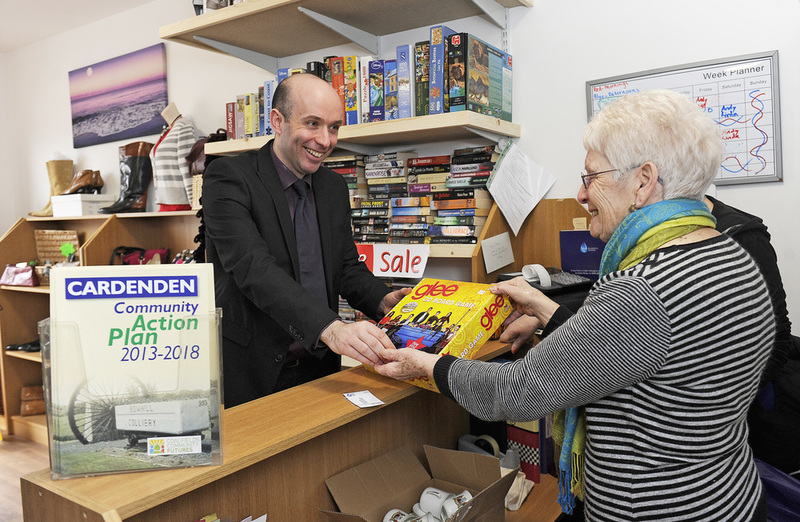 Once the Minister had made his announcement, there was time to take a short walk round to the new community charity shop, which gave some first-hand insight into the benefits of participatory processes for local people that Marco Biagi spoke of. We met one woman who was just turning up for her first shift as a volunteer in the shop. Having recently lost a close family member she was keen on becoming more active in the community. When she had a look to see what the new shop was all about it was suggested that she might like to volunteer. She was happy to take the opportunity to give something back, as well as meet new people she hadn’t seen for a while and learn new things. In addition to learning more about a local PB process, the event was an opportunity for local people to reminisce about their community and reflect on how it has changed. People also talked about the future and there was a sense of optimism that the PB process had led to more sustainable community activity in the longer term. We asked Marco Biagi to outline what his ambitions for PB were. He replied that he wanted to see PB spread out across the country as the “go-to method” for investing in communities. You can find out more about the £2 million announcement here.